Azerbaijan's first family has been accused of funneling millions of dollars to senior political officials in Malta, including the prime minister's wife, in a case that is threatening the collapse of the Maltese government. On April 20, a Maltese investigative journalist published documents showing that a Dubai-based bank owned by Leila Alieva, daughter of Azerbaijan President Ilham Aliyev, had made a $1 million payment to a company that is owned by Michelle Muscat, wife of Maltese Prime Minister Joseph Muscat. And that $1 million wasn't all: "Other 'loan payments”' were of around US$100,000 each and made twice a week over several weeks in January, February and March last year," the journalist, Daphne Caruana-Galizia, reported. The Azerbaijani connection was discovered in the process of unraveling a larger, ongoing scandal involving shady financial dealings by Maltese officials, as first exposed last year in the Panama Papers. The same night that the report came out, a private plane flew from Malta to Azerbaijan under murky circumstances; Malta Today noted that the flight "generated considerable intense interest and speculation on social media" coming as it did after local TV "published footage of the bank’s chairman and its ultimate beneficial owner, Seyed Ali Sadr Hasheminejad, exiting from the bank’s side door with the bank’s risk manager Antoniella Gauci, and carrying two large suitcases." Two other senior Maltese officials -- the prime minister's chief of staff and a senior minister -- also have been linked to the case, and they have threatened to sue Caruana-Galizia for libel. On April 29, though, the whip for the ruling party resigned in apparent protest over the government's handling of the affair. It remains unclear why Azerbaijan might have been making these secret payments to the Maltese officials. Muscat, along with the other two implicated officials, made a quiet trip to Baku in 2014. They didn't take any journalists along on the trip, contra normal practice in Malta; Muscat later said that was a mistake but the secrecy is being reexamined in light of the new allegations. Muscat visited Baku again in 2015; he said that "he witnessed rapid development processes in Azerbaijan, adding Europe should give objective assessment to these positive processes," according to an account from the Azerbaijani presidential press service. 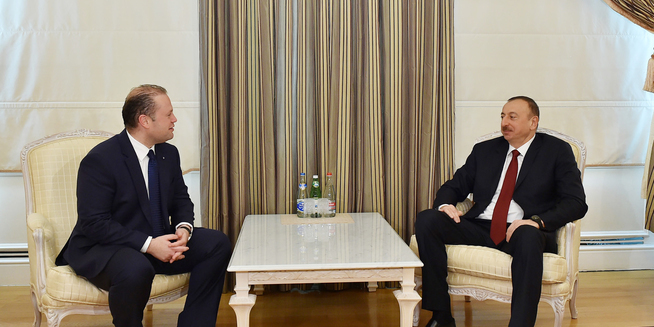 On April 18, Azerbaijan's foreign minister Elmar Mammadyarov visited Malta and met with his counterpart George Vella. "They noted that the relationship in the field of energy remains mutually beneficial and there is a wide range of areas, namely tourism, investment, transport, with full of potential for economic cooperation," AzerNews reported.